Darker evenings, colder temperatures, and the start of rainy season all cause me to crave a warm, hearty, and nutritious bowl of soup for lunch or dinner. This crockpot butternut squash soup meets the criteria – and it’s easy to make during a busy time of year! The soup emerged from my current culinary obsessions with the crockpot, my knows-no-seasons love of butternut squash, and a marathon-training-induced craving for grilled cheese and soup. 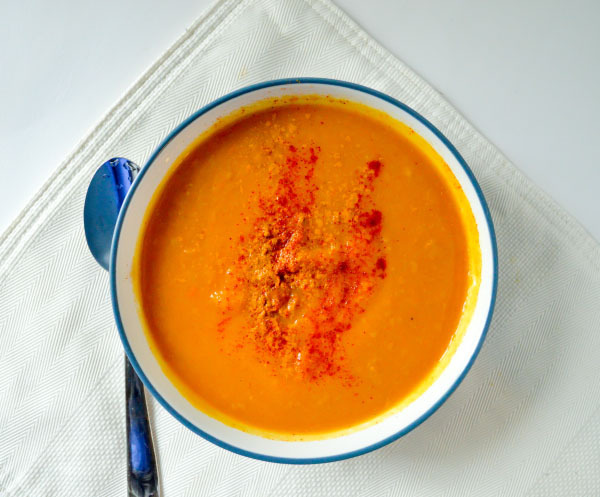 I relied on this recipe from Gimme Some Oven for the cooking method, but I changed the ingredients and spices based on what I wanted and had on hand – which made an incredibly delicious soup! I wanted something savory, nutritious, slightly spicy, and quintessentially fall – so into the crockpot went butternut squash, onions, parsnips, carrots, and a selection of spices. I made this stock from scratch. You can substitute homemade vegetable broth if you are strictly vegetarian, although from a sustainability and taste standpoint I highly recommend chicken stock. Whenever we eat chicken, I save the bones (I purchase whole chickens, bone-in thighs, or bone-in breasts) to make stock each week. I also save the scraps of vegetables – onion peels and trimmings, the end bits of carrots, etc. (just not cruciferous vegetables, as those are too bitter for stock) – for stock. This uses the pieces of food that you normally would throw away and transforms them into a rich and flavorful stock that has a variety of uses, including homemade soup. I always make my stock in the crockpot: I toss in the chicken bones from one whole chicken (or the equivalent) and the vegetable scraps (plus some extra onion and carrot if need be) into the crockpot, add enough water to fill the pot, and salt it generously. Then I cook it for either 4 hours on high or 8 hours on low. Unlike stock on the stove, you don’t need to regulate the temperature to prevent the pot from boiling over. It’s so easy and requires very little hands-on effort. Bone broth also offers numerous health benefits over simple vegetable broth. Bone broth provides collagen, which aids in bone and joint health, and glucosamine, which reduces inflammation. While the scientific community is torn on the immunity boosting benefits of bone broth, consider how you always had chicken soup as a child when you were sick. 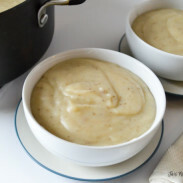 The soup itself is also astounding simple: you combine the stock, vegetables, and seasonings in the crockpot, cook for 4 hours on high, and then stir in the coconut milk and puree with an immersion blender (or a traditional food processor or high powered blender). What you have after this hands-off cooking process is a creamy, earthy, slightly sweet, lightly spiced, decadent tasting, and nutritious soup. 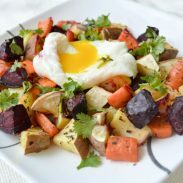 It’s a simple and palatable way to eat your vegetables when the chilly weather causes you to crave comfort food. This soup contains turmeric, which is one of the best spices for runners to include in their diet. Thanks to an antioxidant called curcumin, turmeric has powerful anti-inflammatory properties, especially when combined with black pepper. Turmeric can naturally reduce muscle soreness and aid in post-run recovery. In the crockpot, combine the broth, squash, parsnip, carrot, onion, garlic, paprika, turmeric, salt, and pepper. Cook on high for 4 hours or low for 6-8 hours, until the vegetables are cooked through and soft. Add 1/2 cup coconut milk to the soup. Use an immersion blender or food processor to puree until smooth. If needed for creaminess, stir in the extra coconut milk. This soup tastes just as good the next day! Store the leftovers in the fridge for up to 4 days. Because what is more satisfying after a chilly autumn run than a bowl of soup later in the day? What’s your favorite type of soup? What foods do you use to improve your recovery after a hard run? Ooooooh, yummy! I’ve been eating Amy’s veggie soup like crazy lately because it’s stocked with veggies and I don’t have to cook! HA ha. I’m so lazy. This weekend is a busy one. It’s my mom’s birthday tonight with my whole family and then a zillion kids’ soccer games on Saturday and Sunday. I’m so lazy also – that’s why I love the crockpot for soup! Put it all in there and let it do the cooking. Happy birthday to your mom! Tomato soup is so good! A perfect fall soup! 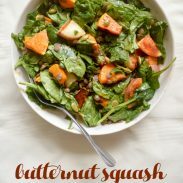 Lots of squash here to eat too so I may have to try this one! We love our crockpot. It is great for those busy days and there is nothing better than coming home to delicious smells in the kitchen! Thank you! I hope you like it if you try it! I agree – I love the smell of crockpot food! Right now there’s a curry in my crockpot and it smells amazing. Time for me to finally break in that slow cooker, huh? This looks awesome! Yes, time to break it out! and thank you! Mmm, homemade stock makes soup so good and extra rich! 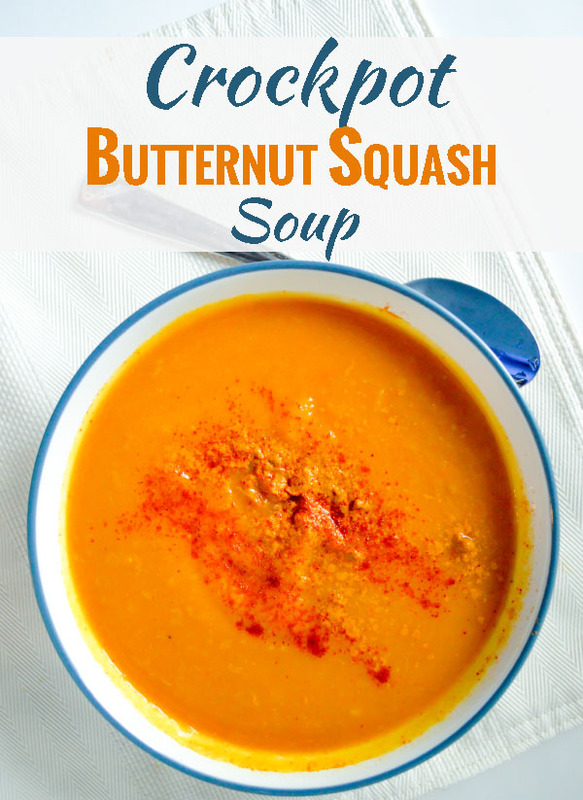 And butternut squash is one of my favorite soup ingredients! The homemade stock does make a difference – and it’s so easy to make! This is uncanny!!! I was just telling someone that I wanted to find a good crockpot squash recipe.. so thanks for making my dreams come true. Lol! This looks amazing!